Benjamin Franklin admired the North American wild turkey (meleagris gallopavo) so much that he wanted the wild turkey to be our national bird. At one time the estimated number of wild turkeys in the United States was 10 million. Overhunting and destruction of wild turkeys’ forest habitat caused their numbers to drop to 300,000 by the 1950s (found at that time mostly in southern states). Since then, wild turkeys have made a remarkable comeback due to conservation efforts and reintroduction. Wild turkeys stand 2-3 feet tall, weigh between 7 and 24 pounds, and have iridescent dark brown, gold, green and red feathers. They spread their elegant tail feathers into a fan when they are courting or alarmed. Long legs propel them into sprints that have been clocked at 25-30 miles per hour. They spend most of their time on the ground in and near woods, foraging at dawn and dusk on their natural foods (nuts, acorns from mature oak trees, seeds, insects, frogs, snakes, spiders, and grasses). They roost in trees at night to avoid their many predators that include bobcats, mountain lions, and coyotes. The turkey hen nests in a shallow depression on the ground or in thickets. When the poults (baby turkeys) are a month old they can fly up to roost in trees with their mother and her flock. At that age a pecking order among the poults has already been established. Young turkeys live with their mother and learn from her for four or five months. Wild turkeys are very social animals with good memories. With luck, they can live 10-12 years. Many perceived problems concerning wild turkeys are related to humans putting out food for what can soon grow to be a large flock. Wild turkeys do not need handouts from humans. Once turkeys are habituated to receiving supplemental food from humans, it is difficult to change their habits. Established habits of both birds and humans are hard to break! Therefore, efforts to de-habituate wild turkeys must involve everyone—including your neighbors and people you never may have met who are buying birdseed or bags of corn and scattering it in their yard or in places where no one sees them. Some people may be allowing wild turkeys to pick up the spilled seed under their birdfeeders or be feeding turkeys their kitchen scraps. If wild turkeys are receiving food from someone in your area, it will make it much more difficult for the following suggestions to be effective. Nevertheless, here are some strategies that can work. It’s best to take action when the turkeys first show up. Remove backyard bird feeders if turkeys have been eating spilled seed under them. Turn on the water and with a hose direct a stream at the turkeys’ feet. Opening an umbrella will frighten turkeys if they seem not to be afraid of humans. So will chasing them with a broom. Farmers have frightened away wild turkeys by flying predator kites from tall poles. Metal poultry wire can be placed over berry bushes and fruit trees. Do not use polypropylene bird netting as it can entangle and trap nocturnal wildlife such as opossums and skunks. It’s not easy to release a skunk trapped under bird netting! 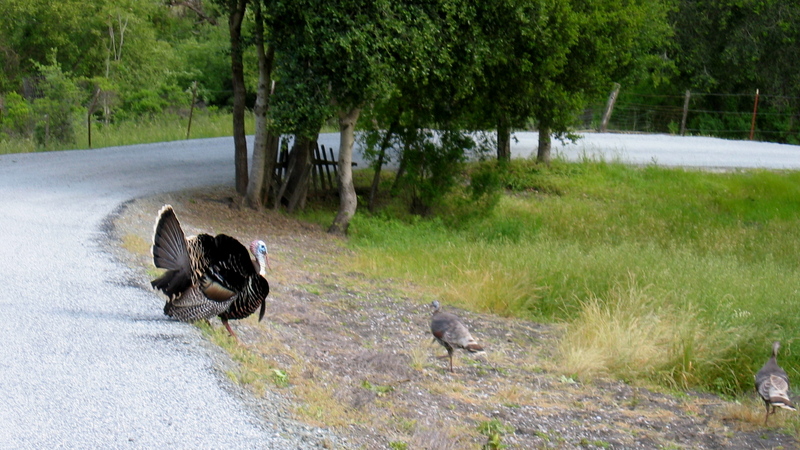 Wild turkeys are perceptive and notice changes in their habitat. Unusual objects (such as rope, boxes, balloons, reflector tape, an old fashioned “farmer John” scarecrow) placed in a garden and moved to new locations in the garden from time to time can alarm them. Light up the roosting area with bright lights or install a motion sensitive sprinkler there. If a turkey is pecking at a shiny object such as a vehicle or window, cover the object and chase the turkey away. Do not use inhumane, sticky substances that trap wild creatures when they touch or step on the sticky substance. Wild creatures that become stuck sometimes tear off their own legs trying to escape. Sticky substances should not be used to deter turkeys or any other wildlife. Install a motion-sensitive sprinkler such as ScareCrow or Spray Away in areas frequented by wild turkeys and activate it only during the day. It shoots out forceful squirts of water when turkeys pass near it. Keep in mind that other wildlife and pets may also set it off. Use it only as a last resort after trying all other methods of deterrence. A dog on a leash will frighten turkeys away. Do not allow dogs to harm turkeys. 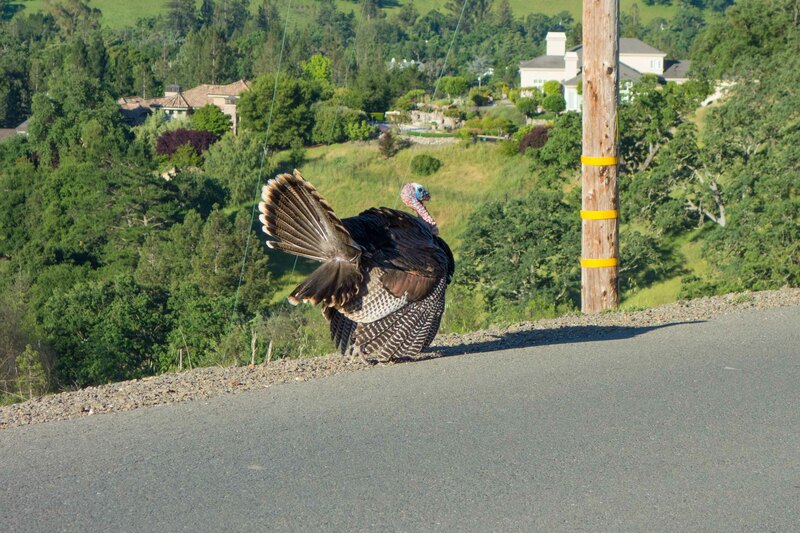 Request that your community make it illegal to feed wild turkeys. Keep wild turkeys wild. Problems arise when turkeys lose their fear of humans. This happens when they become accustomed to living in human habitat (with human- supplied food, highways, decks, parked cars, and railings). Prevent most problems by chasing them off and not feeding them when they first show up in your area.